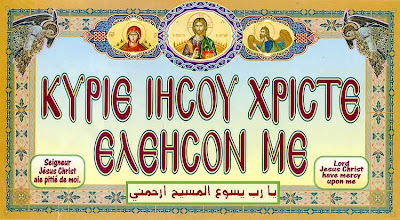 Online book of “The Jesus Prayer”. A classic treatise on the Jesus Prayer written by Fr. Lev.Gillet,also known through many of his writings as “A Monk of the Eastern Church”. The Name of Jesus maybe either pronounced or silently thought. In both cases there is a real invocation of the Name, verbal in the first case, and purely mental in the second. This prayer affords an easy transition from verbal to mental prayer. Even the verbal repetition of the Name, if it is slow and thoughtful, makes us pass to mental prayer and disposes the soul to contemplation. … And I will wait on thy name. Psalm 52:9. Before beginning to pronounce the Name of Jesus, establish peace and recollection within yourself and ask for the inspiration and guidance of the Holy Ghost. “No man can say that Jesus is the Lord, but by the Holy Ghost” (Α Corinthians 12:3). The Name of Jesus cannot really enter a heart that is not being filled by the cleansing breath and the flame of the Spirit. The Spirit himself will breathe and light in us the Name of the Son. A common mistake of beginners is to wish to associate the invocation of the Holy Name with inner intensity or emotion. They try to say it with great force. But the Name of Jesus is not to be shouted, or fashioned with violence, even inwardly. When Elijah was commanded to stand before the Lord, there was a great and strong wind, but the Lord was not in the wind; and after the wind an earthquake, but the Lord was not in the earthquake; and after the earthquake a fire, but the Lord was not in the fire. After the fire came a still small voice, “And it was so, when Elijah heard it, that he wrapped his face in his mantle, and went out, and stood…” (I Kings 19.13) Strenuous exertion and the search for intensity will be of no avail. As you repeat the Holy Name, gather quieti little by little, your thoughts and feelings and around it; gather-.around it your whole being. Let the name penetrate your soul as a drop of oil spreads out and impregnates a cloth. Let nothing of yourself escape. Surrender your whole self and enclose it within the Name. Moreover, the invocation of the Name seldom leaves us in a state of dryness. Those who have some experience of it agree that it is very often accompanied by an inner feeling of joy, warmth and light. One has an impression of moving and walking in the light. There is in this prayer no heaviness, no languishing, no struggling. “Thy name is as ointment poured forth… Draw me; we will run after thee” (Song of Songs 1:3-4). ” Unite my heart to fear thy name” (Psalm 86:11). Too often our prayers are limited to petition, intercession and repentance. As we shall see the Name of Jesus can be used in all these ways. But the disinterested prayer, the praise given to God because of His own excellency the regard directed towards Him with the utmost respect and affection, the exclamation of Thomas: “My Lord and my God! “–this ought to come first. This leads to pure adoration. As we pronounce the Name, we should respond to the presence of Our Lord. “They… fell down and worshipped him” (Matthew 2:11). To pronounce thoughtfully the Name of Jesus is to know the allness of Our Lord and our own nothingness. In this knowledge we shall adore and worship. “God also hath highly exalted him and given him a name which is above every name: that at the name of Jesus every knee should bow” (Philippians 2:9-10).